The Rodeo City Rollergirls would like to thank two amazing teams, the Willamette Kidney Thieves & the Whidbey Island Rollergirls for traveling out to play us! What a fun night! The first bout was our Rodeo City Posse against Whidbey Island. It was anyone’s game at the start, but The Posse took the win. Final score: Rodeo City Posse 157 to Whidbey Island 111. Whidbey Island voted Hula C Nation as The Posse MVP! Those Hula hits are insane! 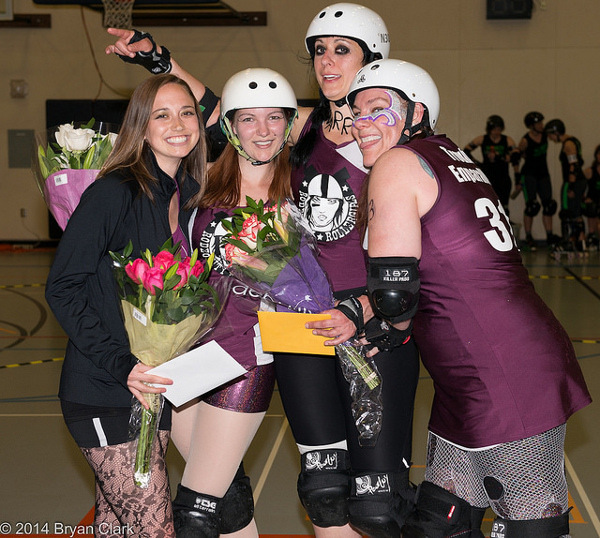 After the bout Rodeo City said farewell to three wonderful ladies. It was the last home bout for Reapercussion, who has been with Rodeo City since our first informational meeting in 2010! This was the last bout for Ariel Pain and Kel-See YaLater. They all have given us so much and we will miss them even more!!! The second bout was our Rodeo City Beauties against the Willamette Kidney Thieves. This was the very first bout for a couple of our Beauties and they did a great job! Final score: Kidney Thieves 198 to Rodeo City Beauties 127. The Kidney Thieves voted Switchblade Sage as the Beauties MVP! She got lead jammer every time she was on the line! Thank you to everyone that gave their time to make this such a great evening! Volunteers & Fans! You are the best! RCR photographer Bryan Clark ran about the track snapping pics! Have a look on our photos page.